If you’re feeling queasy lately, you’re not alone. The daily media poundings are hard to shut out, seemingly every broadcast focusing on terrorism and terrorist activities—past, present and anticipated. We are in the crosshairs of a staggering economy and political witch hunts to lay blame on those responsible for 9-11, a $500+ Billion deficit, joblessness, the War, and the soaring price of gasoline. Here in California, voters (for the first time in history) swallowed a poison pill and supported The Terminator’s $15 billion debt-bailout bond, and are slowly feeling the price tag: drastic cuts in school funding; school and program closures; cuts in social programs and jobs; police and fire department closures; and scores of municipal infrastructure cutbacks. The University of California just turned away 7,600 qualified applicants. We listen to our Senators and Congressmen, to our President and White House officials. We anxiously await Government and Senate investigative reports; and testimony from Alan Greenspan, looking for signs of “The Recovery”. But can and should we believe differently from what we see firsthand? This election year, and its circus of multi-million dollar ads, are polarizing people further. Are we “winning” The War, or is there no winning position? Are we sending in more troops, or are we pulling out sometime in 2005? 2006? Are we still in a Recession, or are we to subscribe to the White House and Wall Street view? What about the 308,000 “new jobs” reported recently. Who authors those reports and how many were “temp” jobs? When do we get the straight story on all of this? When it’s too late, evidently, or perhaps never. In San Francisco, our new man on the job, Mayor Gavin Newsom, has been found guilty of straight talk, announcing our $352 million deficit on a budget of $1.2 billion—and his intention to take it on full bore. Like us, though, he doesn’t sugar coat issues and has forewarned all supporters that he may not be popular for long. Jobs will be cut, but have not been formally announced yet. Everything in the budget is being scrutinized, and “quality control” is taking on a new, positive meaning under his regime. Herein lies the challenge: Produce your way out of an enormous financial hole, while sweet-talking Business into expanding operations into San Francisco—or preventing companies from fleeing the City to other parts of the State where housing and labor costs are far more reasonable. Homelessness remains the Mayor’s #1 concern, since San Francisco has more than 9,000 benefit recipients—each taking home $410/month. According to Newsom, San Francisco experiences more deaths to homelessness than New York, Chicago and Philadelphia—all combined. It is difficult to envision a burgeoning environment under the present economic turmoil. The Mayor’s Tax Assessor, Mable Teng, let loose an appeal of her own to those who hold commercial buildings valued at $50 million or greater. The cause celebrè? Help San Francisco maintain its level of services…by withdrawing applications to reduce property taxes—applications which are, of course, founded on (Prop 13) the notion that building owners have actually lost value during the past several years of economic decline. The Assessor’s letter reminds building owners of their hay-days (those who actually made money during, and kept it after, somehow, the dot-com boom). If you thrived back then, the Assessor is requesting a “gesture of goodwill” to give something back to your community now, when they really need your tax revenues most. We anticipate thumbed-noses across the board, but will be pleased to report any philanthropic landlords. Finally, we take a break from the pandemonium to focus our attention on local, San Francisco Bay Area commercial real estate activity, or lack thereof. Our news pales in comparison, but at least we are in touch with “the man on the street” and tie together the notion that business decisions evolve from our expectations and view of the present and future. We specialize in representing tenants, only. And we make it our business to understand the landlord’s plight. We extract concessions for you, our tenant-clients. When we negotiate with a landlord, they are hard pressed to dispute the naked truth: There is no recovery in sight. Our markets “work”. That is, given time, all free markets seek their own equilibrium. The driving force, pressuring rental rates in our super-saturated office markets, has been the sublease market—the market controlled by the weaker of two entities controlling space, tenants! Tenants have been deeply discounting their excess space to get it off their books, presenting great opportunities for incoming subtenants—or, for landlords to cooperate in wrapping those subleases into new direct leases. CONCLUSION: Total net absorption of space in 1Q, ’04 in San Francisco was on the positive side, at 177,000 square feet—BUT Sublease net absorption was 512,000 square feet. Pricing of space, as you can see from the chart below, clearly indicates (in every Bay Area market) the deep discounts associated with sublease space. Sublease space is where the action has been, to the exclusion of landlords’ direct space. Direct space absorption—in EVERY Bay Area market-was negative (less than zero growth). San Francisco landlords were 334,000 square feet in the red, in 1Q; more than 1 million (!) square feet in the red throughout the Bay Area. Pricing in demand; a tough job in tough times. In a market where the average space sits vacant for 14-16 months before it’s leased, what function can the market provide to literally create demand? How about cheaper rent; higher tenant improvement allowances; free rent; lease assumptions; moving allowances; offering greater flexibility to create expansion, contraction and termination options? Pundits have been arguing that the market “bottom” has occurred, but how can that be true when our local economy doesn’t demonstrate material growth? Total net absorption in ALL Bay Area counties (territories comprising 320 million square feet of space) amounted to only 157,000 square feet! CONCLUSION: Average asking rental rates declined in EVERY Bay Area county in 1Q, ’04, with the exception of San Francisco, which rose $0.58/sf/year. We do NOT forecast the beginning of any trend toward higher rates in San Francisco, under present circumstances. Sustained quarter-after-quarter, positive growth will be required before we should expect rental rates to rise in any sector. There is, of course, a torrential flood of hype during this election year about the “recovering” economy—and landlords will jump on that bandwagon. Rental rates are lower, now, than ever in the past 22 years we have represented tenants. Adjusting for inflation, our markets have priced in office space at extremely cheap levels. Market pricing has declined sharply and steadily, for the past 11 straight quarters. “New” supply outpacing demand. The greatest supply of office space to crush the markets has not come from new development or conversion of buildings. Tenants, themselves, have created the mass of vacancies throughout the Bay Area. Eventually, after the conclusion of a long cycle of corporate, service and manufacturing consolidation, the sublease markets will burn off most of its excesses; landlords will finally renegotiate remaining lease term commitments and convert “stub” terms into longer term, direct deals; or landlords will—especially in the case of good credit tenants with short-terms remaining—milk those leases until the terms expire. The proverbial road will lead to the landlord community controlling more of the open market than (for example) after the dot-com decline. For the time being, though, consolidation continues in the tenant community, and the sublease market—to the chagrin of the landlord community—continues to drag rental rates down. Our narrative above, and the chart below, describes absorption of (demand for) space. The total supply of available space in San Francisco, at ~19 million square feet, remains at its highest levels of the previous 11 quarters. Direct vacancy rates have risen each and every quarter during that time. Corresponding to the “burning down” of the sublease supplies, sublease vacancy rates have steadily declined, but nevertheless amount to more than 3.4 million square feet. CONCLUSION: There is NO RECOVERY evident in any of the San Francisco Bay Area office markets, on a county by county basis. In fact, supplies of space are higher today than in any period during the past three years. Sublease vacancies remain a relative thorn in the side of the landlord community, and pose great economic alternatives to those tenants in the market able to take advantage. Consolidation within the tenant community continues, and the drive to cut costs and boost profitability—the fight to survive—remains a central theme. Below we’ve surveyed the entire 103 million square foot inventory of San Francisco, and illustrated the companies with the most control of space on the market, the Top 25. You know from our other stats that 19 million square feet is now on the market in San Francisco. The top 3 companies, all office leasing brokerage firms, control over 24% of the City’s vacancy, more than Shorenstein (#4); Equity Office Properties (#6), the country’s largest REIT; Boston Properties (Embarcadero Center, #7); and more than Hines (#8). Surprised, are you not? Mihalovich Partners is extremely proud to have represented The California Academy of Sciences in its negotiations to relocate to a temporary facility at 875 Howard Street, in the Yerba Buena area. The Academy’s lease was the largest transaction in San Francisco in 2003, and promises to bring a spectacular community asset to our downtown core. To learn more about the services we provided to the Academy, please call us. At 875 Howard Street, the Aquarium will house 5,000 live animals, 85% of the current species including penguins, fishes, snakes and frogs from Steinhart Aquarium. 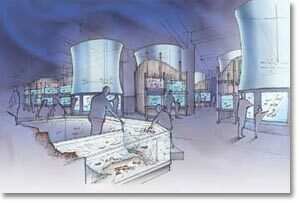 The inside-out design will allow visitors to see the mechanisms that power the Aquarium, sense the temperature and salinity of the tank water, feel the dirt in dry habitats and interact with aquatic biologists as they study and care for the animals. The downtown location will also host rotating natural history exhibits, opening with Ants: Hidden Worlds Revealed. Incorporating living specimens, sophisticated technology, and the knowledge of Academy scientists, the intricate society of ants will be examined and explained in this first exhibit. The Academy will be a unique addition to the wide range of cultural and entertainment attractions serving families in the Yerba Buena Gardens: Zeum, the Children’s Garden; the bowling and ice skating center, and the Carousel. Major cultural organizations in the area include Yerba Buena Center for the Arts, SFMOMA, the California Historical Society, Sony Metreon, and the Cartoon Art Museum.